Last year, nearly 54 percent of teens in the 16-19 age range who were trying to get their first job – their official entry into the U.S. labor market – were unemployed, according to the U.S. Bureau of Labor Statistics. And employment levels among all 16- to 19-year-olds have plummeted, from 41 percent in 2000 to just 29 percent last month. These trends cut across white and minority groups, Modestino found. It may be tempting to conclude that more idle teens this summer will be lolling on their parents’ couches or playing video games for hours. But the reasons for this shift out of employment are more complex. Almost two out of every three teens are not even looking for a job. One big reason is that they are more likely today to view school and work as mutually exclusive activities, especially while attending high school. And high school and college enrollments are rising for teens from low- and middle-income families. More ominous developments are also at work. 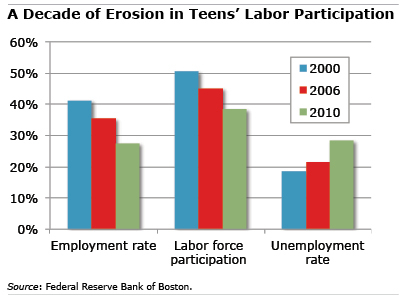 Employment opportunities have shifted away from routine work and toward jobs requiring technical expertise, putting inexperienced teens at a disadvantage when competing for jobs. The job market could also be increasingly polarized into high-level and unskilled work, which hollows out the middle and drives recent college graduates into jobs once held by high school students, the Federal Reserve study said. “They’re squeezing the teens out of the jobs,” Modestino said. The problem is especially acute for teenagers not planning to attend college. “An increasing share say they’re having a harder time getting their first job,” she said. Those number impress me, but not necessarily in a good way. Jobs shouldn’t be that hard to get these days, even for teenagers. All it takes is a little bit of motivation and hard work to make something work for you. If you start at the bottom you will be able to easily pay for a lot of awesome things down the road!